The death of George Jones made us troll our collection to find this gem, The Tammy Wynette Southern Cookbook. 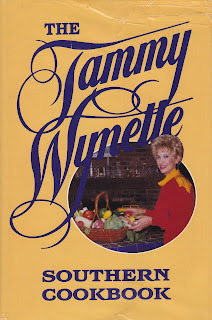 Now Tammy penned this little cookbook after she and George had long split, but one simply can't think of George without a passing thought of Tammy. "As many of you know already, I was born on a sharecropper farm in Itawamba County,Mississippi. We had no running water, no indoor plumbing, and no stove. We cooked over an open fireplace with water drawn and handcarried from a nearby spring.... In the years that have passed since then, I've preformed on every continent, in hundreds of cities, and in nearly every state in the U.S. ...I've entertained in the White House numerous times, and before other heads of state, in addition to preforming in some of the most famous concert halls in the world. Yet, despite all these honors, my roots are pure rural Mississippi." While she admits to gathering many of her recipes from her grandmother, she is not adverse to a bit of 1950's kitchen helpers. There are Ritz crackers, cake mix, tons of canned soup and even some canned asparagus. A good third of the book is dedicated to dessert. There are chocolate pies, chess pies and cobbler, with eggs if times are good and it plain ol' berries when they are not. There is not a lot of exposition to these recipes. Either you have it or you don't. This cake was passed on to her by some friends. Bake at 350 degrees for 45 minutes in tube pan. We believe that the ingredients should be thoroughly mixed before dumping into the tube pan. And the tube pan should probably be oiled and lightly floured. Simply close your eyes and think of the possibilities with all those Jell-o flavors. Close your eyes and see Tammy waiting for George at the Pearly Gates, Jell-o Cake in hand. The Jell-O cake could also be a poke cake, where you punch holes in the baked cake with a wooden spoon handle and pour the liquid Jell-O over it, then refrigerate. I should look for a copy of this. I would look good on the shelf with Mother Maybelle's Cookbook. I do love a Little Black Car who knows their Jell-O cake. I never thought of the hole punch technique. And, I am soooo jealous of Mother Maybelle. That is one I have never picked up.